Inspired by Frank Lloyd Wright, the American architect Kendrick Bangs Kellogg gained international recognition during the 1960s and 1970s for his innovative work in organic architecture. Some of his designs resembled rolling waves, flowers, seashells and wings. In 1961 Kellogg came to Kailua-Kona and built a house without walls. The inward curves of its three domes suggest the furl of the hapu’u fern, while its lava terraces resemble Hawaiian heiau (temples). Its arched, multilayered roof panels are translucent, letting light into the house during the day and glowing at night like a lantern. As her taste in architecture might suggest, von Beck had an eccentric streak. She lost interest in the house when she took off to sail the South Pacific. The property fell into disrepair. Eventually she stopped paying the mortgage. When her niece Elizabeth McCormick bought the house in foreclosure in 1984, it was in sorry condition. Trees had sprouted from the planters, tearing up the masonry. Holes in the roof allowed the rain in. Vines threatened to swallow the house whole. It was “like a ruined Mayan temple overtaken by the rainforest,” McCormick says. 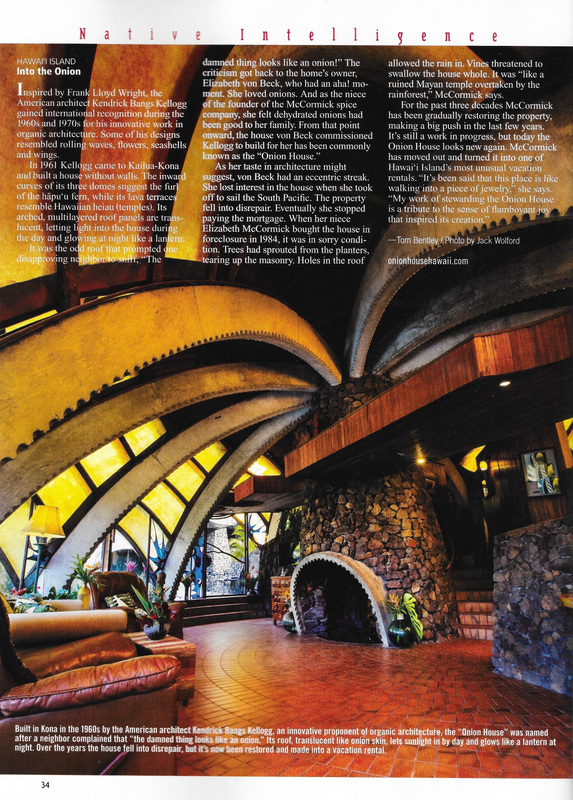 Caption: Built in Kona in the 1960s by the American architect Kendrick Bangs Kellogg, an innovative proponent of organic architecture, the “Onion House” was named after a neighbor complained that “the damned thing looks like an onion.” Its roof, translucent like onion skin, lets sunlight in by day and glows like a lantern at night. Over the years the house fell into disrepair, but it’s now been restored and made into a vacation rental.